If you are accustomed to using graphs and function curves, you can use the Function view to define trajectories. 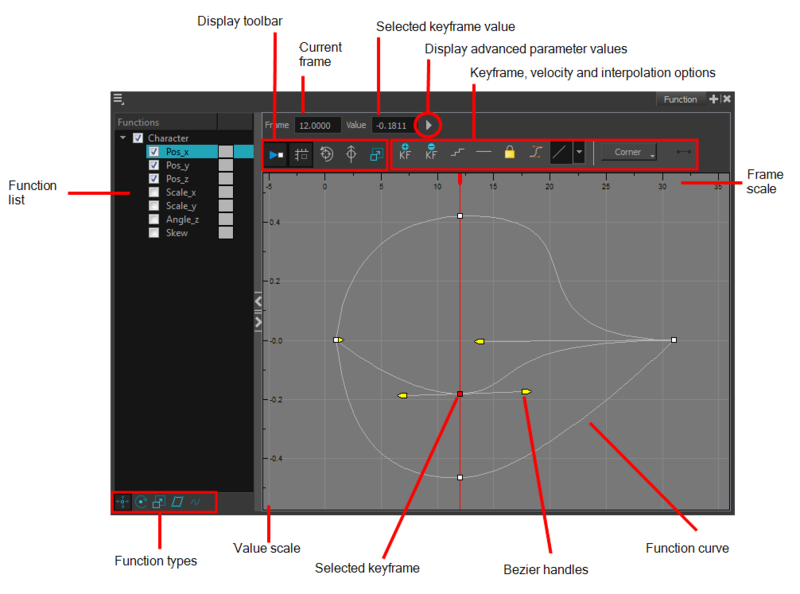 The graph in the Function view displays the motion over the first and last keyframes set in the scene, as well as any keyframes created between. If the scene is 60 frames, but the character's motion ends at frame 40, then the editor will only display up to frame 40. 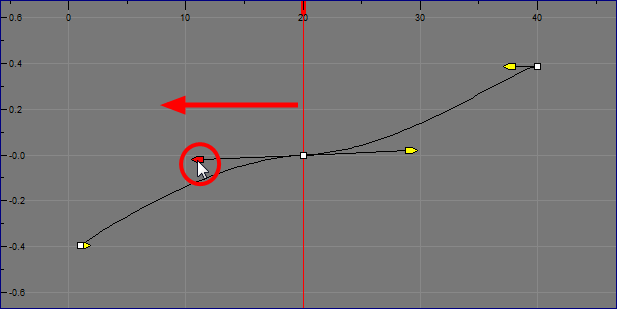 Drag the point up or down, or click and pull one of the handles to adjust the curve of the graph. In the example above, changing the velocity from a straight line (constant velocity) to a curved one changes the ease-in (where the curve shoots up and then flattens out) and ease-out (where the curve flattens out and then shoots up) values. The centre keyframe cannot be dragged up or down because the velocity is set. Theoretically, dragging it downwards towards zero would put it back to a place of nonmovement. 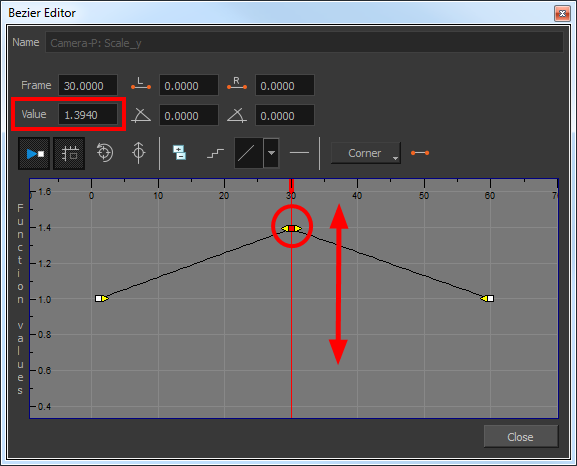 Press the Enter/Return key with the editor still open to watch the result of your curve adjustment in the Camera view. Double-click on the parameter layer name to open the Function editor window or click once on the parameter layer to display it in the Function view. 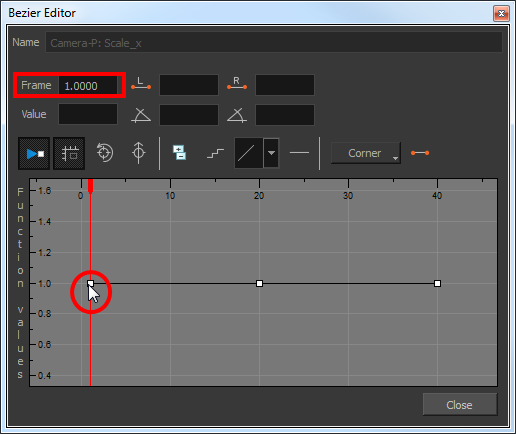 ‣ In the graph section, click on the frame number where you want to make changes. ‣ In the Frame field, enter the frame number. In the graph, the vertical red line moves to the frame number. 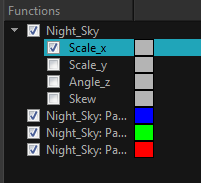 ‣ In the Function editor, click the Add/Remove Keyframes button. ‣ In the Function view, click the Add Keyframe and Delete keyframe buttons. Click on the newly created keyframe and drag it up (to decrease the width of the object) or down (to increase the width of the object) or pull on the handles to create a smooth fluctuation of the drawing object's width. 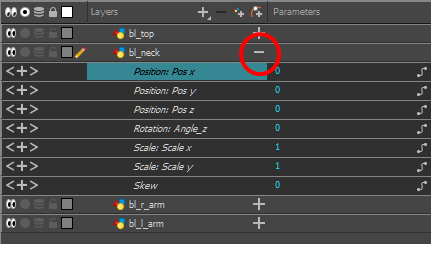 If you do not like the changes you just made, select and delete the new keyframe by pressing Delete or clicking the Add/Remove Keyframes button. Keep adjusting the values until you're satisfied with the results.